The Orioles continued their red-hot start by riding a pair of two-run homers byJ.J. 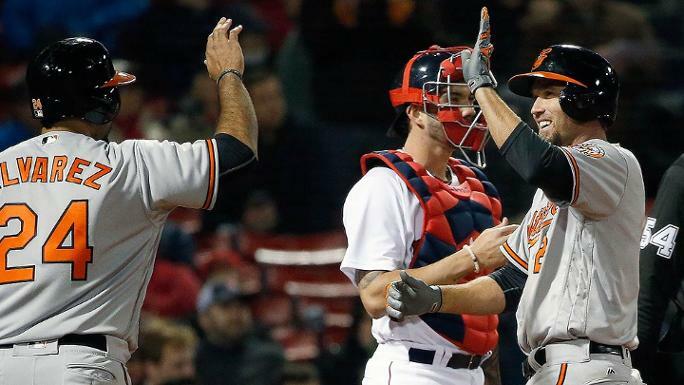 Hardy and a mammoth game-tying blast by Mark Trumbo to a 9-5 victory over the Red Sox on Tuesday night at Fenway Park. At 7-0, the Birds remain the only undefeated team in the Major Leagues. This is the Orioles' best start since moving to Baltimore in 1954 and the best for the franchise since the St. Louis Browns went 9-0 to start the 1944 season. It also comes on the heels of a lackluster Spring Training, in which the O's didn't pick up their first win until their 13th game. "Yeah, what do you know? I think the fact that we didn't panic when that happened is the same reason that we're staying pretty calm and collected and focused while we're enjoying some success, too," Trumbo said. "It's kind of the mindset that's built for the long haul." Just like on Monday, Trumbo seemed to change the entire momentum of the day with one swing. This time, he ripped a two-run shot against Clay Buchholz in the top of the sixth. According to Statcast™, the long ball left the bat at 110 mph and traveled 416 feet. The Orioles took the lead for good later in the inning on a sacrifice fly by Hardy, who finished the night with five RBIs. "J.J., you like to see good things happen to him. He and Chris [Davis arrived for Spring Training] excited about a lot of things in their life," Orioles manager Buck Showalter said. "J.J. is a new father, healthy for the first time in a while. They just seem to be in a good place in their life right now." Buchholz went five-plus innings, allowing five hits and five runs. He walked three and struck out five. The Red Sox have only had one pitcher go beyond the sixth inning in seven games this season. Mike Wright, who hadn't started a game in 15 days, also went five for the Orioles and earned the win, thanks to his team's three-run rally in the sixth. "To be 7-0 is great. I didn't realize it had been so long since an Orioles team had done that," Wright said. "I said in Spring Training our record doesn't reflect the type of team we had. There are still some guys struggling, but everybody's picking each other up. That's the kind of team we have where we're really pulling on the same end of the rope." David Ortiz staked the Red Sox to a 2-0 lead by mauling a two-run homer in the first, No. 506 in his career. The blast came on a night Fenway fans received 500-homer necklace replicas in honor of the slugger. Both of Hardy's home runs were struck down the line in right on a wind-blown night, and the first tied it in the fourth. In the fifth, Mookie Betts smoked an RBI double and scored on a wild pitch to give Boston a short-lived 4-2 lead. Hardy gets Pesky: The Orioles' shortstop twice got the best of the right-field foul pole at Fenway Park, turning in his first multihomer game since Aug. 8, 2014, against the Cardinals. Hardy hit a two-run shot off Buchholz in the fourth and struck again with a two-run homer in the seventh inning that mirrored his first blast. Missed foul pop by Swihart costly: Buchholz had turned in a strong performance leading up to his key at-bat with Trumbo in the sixth. What hurt the most is that catcher Blake Swihart couldn't come up with a foul pop on the fourth pitch of the nine-pitch at-bat, which ended with the game-tying, two-run homer. Trumbo heats up: On the heels of hitting his first homer -- and extra-base hit -- on Monday, Trumbo fell a triple short of the cycle and homered again on Tuesday night. The outfielder had three hits, his biggest a two-run homer in the sixth off Buchholz that hit off the sign on the back of the Green Monster. Bradley's mad dash: One highlight from a frustrating night for the Red Sox was Jackie Bradley Jr. making a terrific read on the double by Betts in the fifth. Left fielder Ryan Flaherty didn't even seem to know where the wind was going to take it, but Bradley never hesitated, roaring all the way home from first at a clip of 10.9 seconds and a top speed of 19.1-mph according to Statcast™. Ortiz's three homers in the first seven games of the season made him the first player 40 years or older to pull off that feat since Hank Aaron in 1974. Papi's double in the eighth was his 293rd at Fenway, passing Wade Boggs for third on the all-time club list behind Hall of Famers Ted Williams and Carl Yastrzemski. The Orioles' 7-0 start gives the club its first seven-game winning streak since 2005. When Hardy curled a two-run homer near Pesky's Pole in right to tie the game in the fourth, Red Sox manager John Farrell asked for and received a crew-chief review to make sure a fan didn't interfere. But after a review of one minute and 40 seconds, the call was confirmed. The Orioles tried to challenge a call in the eighth inning, with Flaherty trying to stretch his hit into a double only to be ruled out at second base. The call was confirmed. In the ninth, Dustin Pedroia grounded out to Manny Machado at third to end the game, but Farrell challenged the play to see if Chris Davis' foot came off the bag. After a brief review, the call was confirmed. Orioles: Ubaldo Jimenez takes the mound on Wednesday night at 7:10 ET to cap their series against the Red Sox. Jimenez has turned in the longest outing for a Baltimore starter this season, going seven innings in picking up his first win against the Twins on Thursday. The righty allowed two runs (one earned) on eight hits with no walks and nine strikeouts. Red Sox: Right-hander Joe Kelly, who gave up seven runs over three-plus innings in his first start of the season in Toronto, will try to bounce back in the finale of this three-game series against the Orioles on Wednesday. Kelly is 1-2 with a 5.40 ERA in five career starts against the Orioles.